MIAMI â" Right now, no one can stop LeBron James. 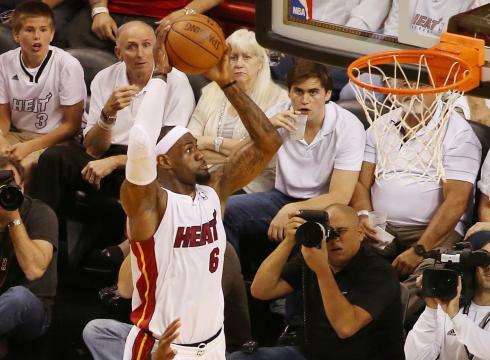 LeBron James poured in 32 points to lead the Heat past the Celtics in Game 1. Picking up where he left off against the Indiana Pacers in the Eastern Conference semifinals, the Miami Heat superstar scored 32 points, had 13 rebounds and shot 13-of-22 from the field in Miami's 93-79 victory against the Boston Celtics Monday in Game 1 of the Eastern Conference finals. In his last four games, James, the league's most valuable player, has scored 130 points (32.5 average) and collected 47 rebounds (11.8). And don't forget James' defense. He also blocked three shots and had one steal Monday. USA TODAY Sports on Twitter! Follow Jeff Zillgitt on Twitter at @usat_jzillgitt. To get the latest sports news from USA TODAY, including game results, columns and features, follow us on Twitter at @USATODAYSports. "As much as you can watch it and prepare for it, I think you need to face it once to see it and get used to it," Celtics coach Doc Rivers said. "I thought at times their speed overwhelmed us for sure." Game 2 is Wednesday in Miami (8:30 p.m. ET, ESPN). "OK, so one down," Heat coach Erik Spoelstra said. "They still have an opportunity in Game 2 to accomplish what they want to." Playing without Chris Bosh (out indefinitely with a lower abdominal strain), Spoelstra has put the onus on James and Dwyane Wade to carry the offensive load. They have delivered â" and done so with the opponent knowing exactly how the Heat are going to try and win. Wade didn't dominate like he did in the final three games against the Pacers but was still effective with 22 points (on 8-for-13 shooting) and seven assists. During an important stretch of the third quarter, James and Wade took over. They had 14 of Miami's 22 points to close the quarter and turned a 50-50 score into a 72-59 lead. As was the case against Indiana without Bosh, the Heat showed they didn't need much scoring from their role players. They just need some, along with outstanding defense and offensive execution. And they got those contributions from forwards Mike Miller (eight points, 2-for-2 on threes), Shane Battier (10 points, 10 rebounds) and guard Mario Chalmers (nine points, four assists). "We get a lot of the press; we get a lot of the headlines," James said of he and Wade. "But our teammates do everything to help us win ballgames." Boston gave it a run. It dropped 35 points on Miami in the second quarter. But the Celtics would score only 44 points on 19-for-59 shooting (32.2%) in the other three periods. Emblematic of the Celtics' struggles, star forward Paul Pierce was held to 12 points on 5-for-18 shooting. Sharpshooting guard Ray Allen shot 1-for-7. The Celtics were also frustrated by the officiating; they were called for four technical fouls, including one on Rivers. "I knew mine wasn't (deserved). I can tell you that much," Rivers lamented. "I don't know how long I've been the league, but that has to rank as the worst I've ever had. I would have loved to have earned it." Kevin Garnett led Boston with 23 points and 10 rebounds. Rajon Rondo had 16 points, nine rebounds and seven assists.